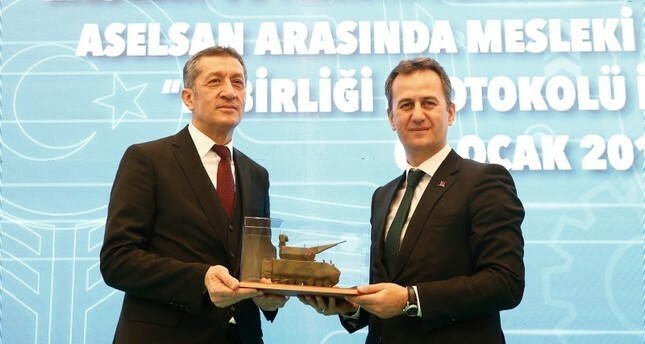 Turkish defense giant ASELSAN has signed a protocol with the Ministry of Education for the establishment of the country's first vocational and technical high school specializing in defense industry systems. The protocol for the school, which will provide qualified workforce for the defense industry, was signed Thursday in a ceremony that saw the attendance of Defense Industries (SSB, formerly SSM) Chairman İsmail Demir, the general director of ASELSAN Haluk Görgün, and Education Minister Ziya Selçuk. Speaking at the ceremony, Selçuk said that "the school will set an example" and similar steps will be taken in the future. Stating that children were now moving toward a different future, Selçuk underlined the importance of the education the school will provide, saying: "If we consider the fact that today's school children will enter the business life in the 2040s, a completely different era will be awaiting for them, an era in which my generation will feel like they are from the Stone Age." Departments such as "electrical and electronic engineering" and "machine technology", and programs such as "defense electric systems" and "defense mechanic systems" will be established at the school. Specialized field or branch courses will be given by the trainers and experts of ASELSAN. The company will also offer internship opportunities for the school's students. The necessary equipment for workshops and laboratories will be provided and upgraded by ASELSAN in line with the newest technologies, while scholarships will also be given to successful students. The graduates of the school will be prioritized when it comes to employment at ASELSAN while the students who want to get a bachelor's or master's degree in engineering departments related to the company's operating fields will be granted scholarships as part of the protocol. Highlighting the importance of the company's works, Selçuk said: "Each and every work that is produced here has a place in the hearts of our children. In this sense, we, as the Turkish nation, owe a special thanks to ASELSAN." ASELSAN designs, develops and manufactures military communication systems, radar and electronic warfare systems, electro-optical systems and defense and weapon systems for the Turkish military, in addition to exporting such systems abroad. The company is ranked 58th on the list of the world's top 100 defense giants in 2016, according to prestigious U.S. weekly Defense News.